Destroyer Silny class of the Soviet Red Navy in World War II. Gordy and Silny class (29 and 19 ships). Type: Russian destroyer class, built 1936-1943. 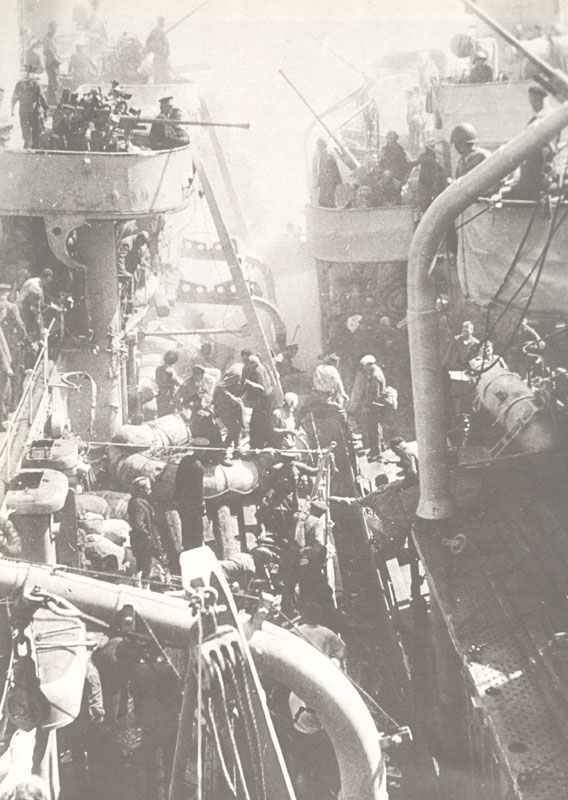 Destroyer Soobrazitelny rescues survivors of flotilla leader Tashkent, which was hit by aircarfts. 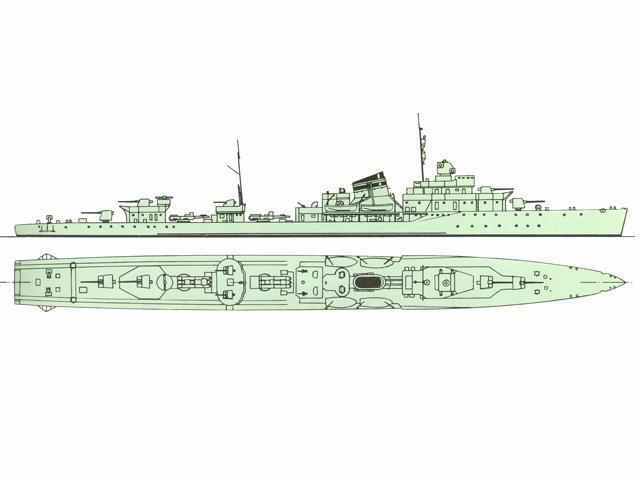 The realization that the Italian design of the Type VII or Gordy Class were too lightly built for operating in the Arctic led to the Type VIIU (uluschonny, improved), and the 20th and 30th units, Silny and Storozhevoi were altered while on the stocks. The redesign included the provision of unit machinery, and so there were two widely spaced funnels instead of the single trunked one. The hull was strengthened and the opportunity was taken to increase power slightly. The excessive vibration in the turbines which plagued the Type VII was apparently cured in this class. They were altogether a great improvement and were used as the basis for future development. Storozhevoi, Silny, Surovy, Serdity, Strashny, Spokoiny, Skory, Statny, Svirepy, Strogy, Strojny – built by Zhdanov yard, Leningrad. Smely (ex-Letuchy) , Stoiky (ex-Lilkhoi) , Slavny – built by Ordzonikidze yard, Leningrad. Smyshleny, Soobrazitelny – built by 61 Kommunar yard, Nikolaiev. Sposobny, Sovershenny – built by Sevastopol dockyard. Svobodny – built by Marti yard, Nikolaiev. On June 27, 1941, Storozhevoi had her bow blown off by a torpedo from a German E-Boat in the Irben Straits. She was rebuilt with a bow from an incomplete Ognevoi Class and recommissioned in 1943. Serdity and Smely were sunk in July 1941, the former by bombing near Osel and the latter by mine in the Gulf of Riga. Statny also went down after striking a mine off Osel on August 18, while Skory was lost from the same cause off Cape Juminda. Sovershenny struck a mine while running trials in the Black Sea and while undergoing repairs in dock at Sevastopol was hit by a bomb and capsized; after being righted she was destroyed by shellfire in April 1942. Surovy was another victim of a mine, off Hangö in Finland in November 1941, while Smyshleny was mined in the Kerch Straits in March 1942. German aircraft accounted for Svobodny in Sevastopol in June 1942 and the Sposobny off the Crimean coast in October 1943. The Soobrazitelny made a number of runs into beleagured Sevastopol with the flotilla leader Tashkent, and rescued the latter’s survivors when she was sunk by air attack. The existence of the Spokoiny is uncertain; she was towed from Leningrad to the Arctic and then to Molotovsk but disappeared subsequently, and was lost, probably in 1944-45. Stoiky was renamed Vitse-Admiral Drozd in 1943. Like most of the survivors she was scrapped in the late 1950s, as the class had seen very arduous war service. The only survivor is the heroic Soobrazitelny, which was decommissioned in 1966 and preserved as a permanent museum ship to commemorate the deeds of the Black Sea Fleet. She is moored at Nikolaiev. A destroyer of the larger Leningrad class is firing its guns during the siege of Leningrad. The Russian destroyer Opitny on the Neva during the siege of Leningrad in the winter of 1942. Unloading annumition from the flotilla leader destroyerTashkent in the besieged Sevastopol.